Monkey Bread, along with Sausage Balls, are family favorites on Thanksgiving morning. I take the bread out of the oven around 8:30am so it is still nice and warm by the time the Macy’s Thanksgiving Day Parade begins. However, for those who prefer to sleep in rather than watch the Parade, both recipes are quite tasty served at room temperature. The combination of gooey Cinnamon Bread and savory Sausage Balls makes for a filling breakfast treat. And we eat enough of both to keep us satiated until the traditional dinner is served around 4:00pm. I don’t remember where I first found this recipe. It was shortly after we moved to Kansas, circa 1990, and I vaguely remember finding it in an old recipe book my grandmother gave me. I do not come from a family of bread makers (how I wish I did…) so I was drawn to this one because it uses frozen bread dough. Since I no longer have the original recipe, I will try to recreate as close as possible here, and then detail my modifications below. We have discovered over the years that using frozen rolls rather than loaves make a difference. I happen to use Rhodes Rolls – although I don’t know if the brand is only available in this part of the country. I have learned, however, that using rolls rather than a loaf of bread facilitates the process. Rolls thaw faster, meaning I only have to remove them from the freezer about an hour before prep time… and rolls are easy to cut. I cut each roll in half, and then in thirds, for a total of six pieces. When making monkey bread for a crowd, I can typically use 16-18 rolls for one bundt pan. The rolls rise to the top of the pan overnight and then bake slightly higher in the oven. When preparing the recipe for just a few people, however, using a dozen rolls is ample. No matter the crowd, however, there are rarely leftovers. The recipe is simply that good. Which is why we only make it once a year. 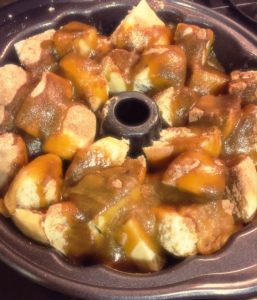 I've never added butterscotch pudding in my monkey bread before – I'm definitely going to have to give it a try! I've never seen an instant recipe for this, though I've seen much more complicated ones! Great Thanksgiving tradition. 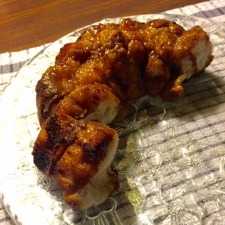 Thanks for sharing the monkey bread recipes, must give it a try. Wish you had a printable recipe. This is fun. I do strata at Christmas for brunch, with sausages, dry tomatoes and spinach. You would love the chocolate festival. With 500 vendors there are so many samples to be had. I have not even started eating the chocolate I brought home. This is our family's Christmas morning treat, it's been a tradition for over 20 years. What a fun tradition for Thanksgiving. The bread looks amazing! Hmmm… I've never tried to create a printable on the blog. Let me give some thought as to how I can do that. Thanks for the suggestion, Linda! We do an egg casserole Christmas morning – although I LOVE the sound of your strata 🙂 The chocolate festival is most definitely on the Bucket List! I'm so glad you shared that experience with us, Esme! Don't you just love time-tested traditions?! It is a breakfast treat for impromptu weekend visitors, Candace!